I have customers who are tryin to pay registration fees for a conference but they are running into problems using American Express cards. I do want them to be able to use an Amex card. Currently I have 4 payment forms and I would like this to be sorted out because my early registration deadlines are coming up. You can easily remove the American Express option, simply click in the payment integration, then go to the toolbar and uncheck it. I DO want my customers to be able to use an Amex card. In other words removing American express is NOT an option and does not solve my problem. 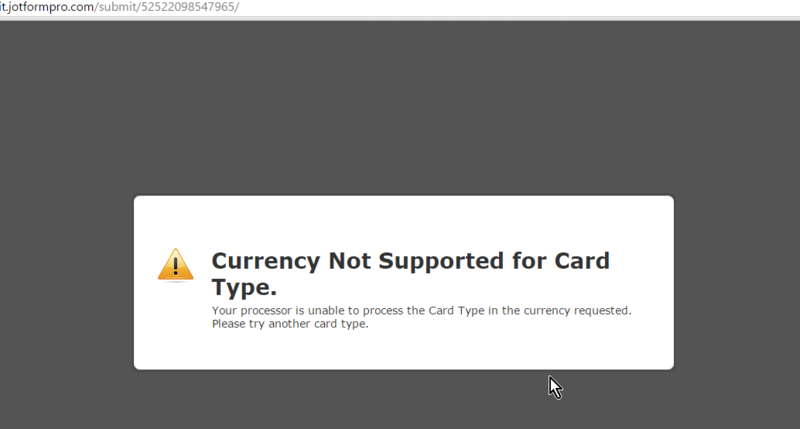 Can you please tell me how to the FIX the problem of JOFORMs not accepting American Express payments! 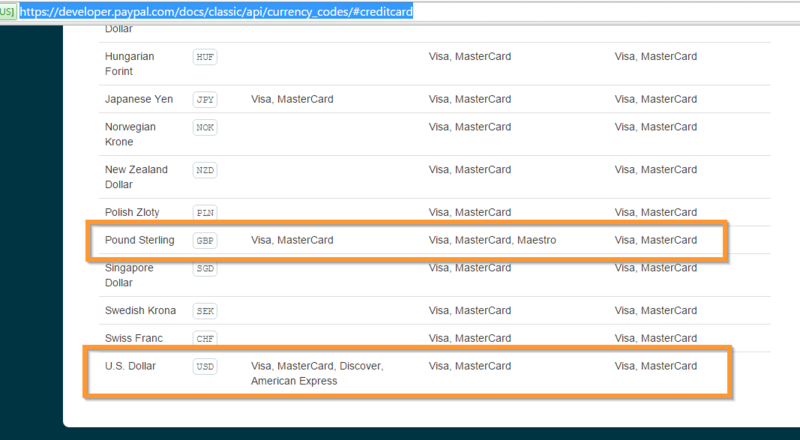 May we know what are the locations of those customers paying by American Express (Amex)? The Paypal Pro (Websites Payment Pro) integration is available in US, UK and Canada. However, there are restrictions by Paypal to which credit card will be accepted, please check this link Paypal Payments Pro: Regional Differences under the "Regional Differences" section. 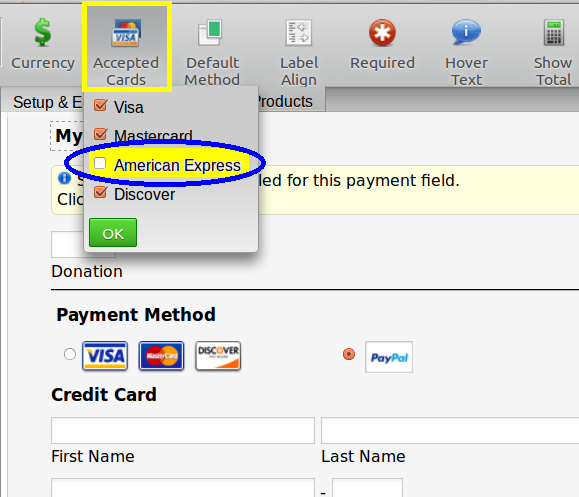 If the customer is located in Canada or UK, unfortunately, Paypal won't accept credit card payments from Amex. Also, would it be possible to know the error messages your customers are getting? That would help us investigate further. My customer who alerted me to the problem is located in the US. below are the forms - please check to see what the problem with Amex is - other card payments seem to process fine. You can see in the list that Pound Sterling is supported only by Visa and Mastercard for cards paid in the US. For American Express (Amex), you might need to use USD as the currency, as mentioned in the link. 80% of our clients pay with AMEX from the US. How can we find a workaround for these clients to pay via the PayPal Payments Pro platform with their American Express cards from the US? 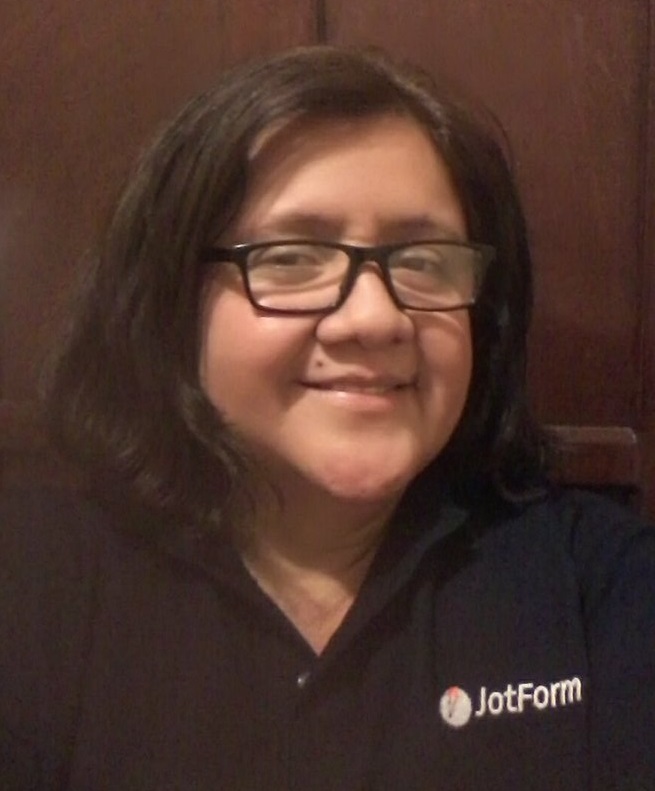 To better assist you, please refer to this link instead: http://www.jotform.com/answers/723851. We will address your concern directly there.